Some of you maybe wondering when am I going to make my next visit. Those visits have been temporarily placed on hold while I acquire a new camera and get a coolant flush done on my car. Due to the fact that I am currently restructuring my finances I have put a hold on all my purchases until all this is settled. So there will be a delay of about a week while I get all that nonsense figured out. In addition to that there is a novel I am working on and a science fiction based website that I working on with a friend. Both of which I have made progress on in recent days. My friend and I are hoping to get the initial pages of the website uploaded soon. If anyone is looking to create a website with actual support and tools to work with outside of the generic space that an ISP such as Comcast has to offer then I suggest GoDaddy.com. I have been very impressed with their level of service. And for the link that I promised I offer you The Literature Network According to their website, "We offer searchable online literature for the student, educator, or enthusiast. To find the work you're looking for start by looking through the author index. We currently have nearly 3000 full books and almost 4000 short stories and poems by over 250 authors. Our quotations database has over 8500 quotes." It is a fun site to poke through. I stumbled on this while doing some research on the Library of Alexandria. Are you or someone you know looking for a library job? 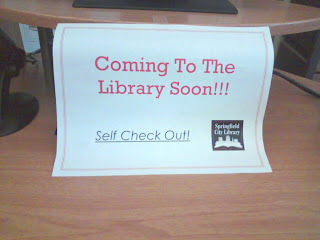 I found this while taking a look at the South Hadley Public Library homepage. It details what they wish for credentials and I do have to add you will be working in quaint, peaceful little slice of Heaven. 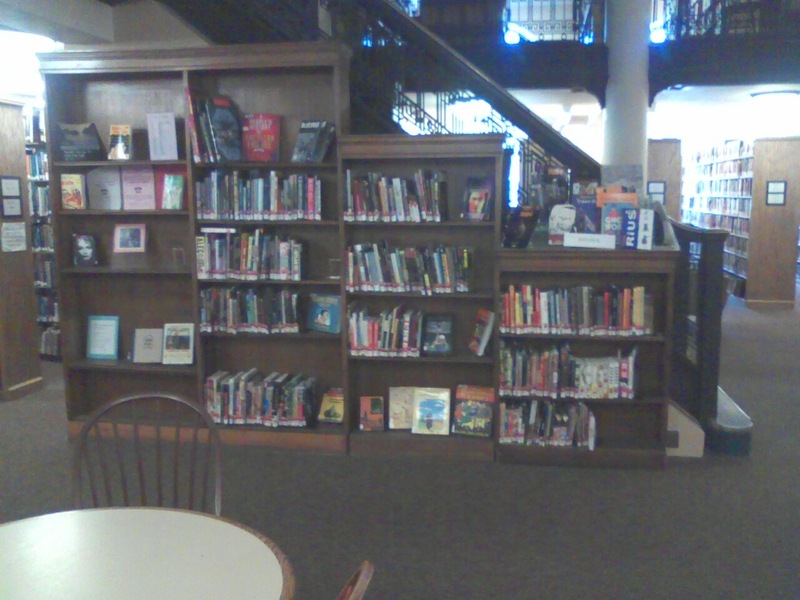 The South Hadley Public Library is seeking an energetic Adult Services Librarian who has 2-3 years public library experience, is knowledgeable with library computer applications including web design, and has strong readers advisory skills. MLS from ALA accredited school and certification by MBLC for public libraries required. The annual salary starts at $35,433/year depending on qualifications and experience. The hours are 35 a week including some in the evening and on Saturdays. Click to see the full job description. Resumes, including cover letter and references, should be mailed to: Jennifer L. Wolowicz, Personnel Officer/Chief Procurement Officer, 116 Main Street, Suite 103, South Hadley, MA 01075. Applications will be reviewed beginning June 28th. The Town of South Hadley is an Affirmative Action/Equal Opportunity Employer. I've been away both mentally and physically the last couple of days, but I am back. I was at the Library of Alexandria... No, I didn't go there. If I had a time machine and had a mastery of ancient Greek this would be a place that I would most certainly visit. I don't officially have a top ten list of places that I would visit. The creation of such a list though could grant me a day of diversion figuring all that out. I did wish to speak on that a bit. When one looks at history long enough it becomes easier to see the threads which tie the events of the past together. The world is a big place. There are a great number of people in it. Changes in history can bubble up from that great mass of humanity. That very fact has made our modern times a much more humane place to live. Anything that has a 'mass' as a preceding word or prefix essentially has the implied consent or at the least a vigorous debate before taking control or moving in a general direction. I am speaking of mass media, democracy, vox pop, memes... etc. However, back in Classical times such movements certainly did not start with the people. While today, individuals of intelligence, strength and skill still can push the world it was far easier back then. The striated social structure of the competing cultures essentially made it necessary to have connections. The unfortunate fact of that situation lead the world to remain in darkness and stagnation as those in power were quite content to remain in power. They could care less about the people they saw as theirs. The usual methodology of civic problem solving for those ancient rulers was provide just enough social services to keep your city from dying and keep the barbarians at bay. Yes, there were varying degrees in the different city-states and you were not required to live in a city. If you wanted to rough it and had the skills the world was your oyster. However, most people were satisfied with the status quo knowing nothing more. Heck, when reading a book is seen as a magical act you really don't know all that much of the world. Worse off if you were a slave and had no choice. Then something magical did happen. I will not say that the idea of enlightened civilization started with the Greeks. There were lights such as Hammurabi who existed beforehand and made their mark, but the reverberations of the great experiment of Athenian democracy is still being felt today. The great philosophical movement which spawned Socrates and the general idea to question the basis of what was taken for granted culminated and coalesced to form the greatest center of learning the that the world had ever known. I am speaking of the Great Royal Library at Alexandria. Such a grandiose plan had to start with one who had such a world shaking vision. That man was Alexander III of Macedon otherwise known as Alexander the Great. King Philip II of Macedon lived at a time when the first outward sparks of Hellenism were being felt by the Classical world. That power was there building in a thriving Greek/Macedonian kingdom with a flourishing cultural life. King Phillip wished for Alexander to be a philosopher-king in the vein of Solon who strove to save Athens from moral decline a few centuries earlier. Alexander would have tutor. That tutor who was chosen over the leaders of the Academy was Aristotle. Aristotle - a student of Plato who himself learned under Socrates. Aristotle who would later found his own center of learning called The Lyceum. King Phillip II gave them the Temple of the Nymphs to study in the boarding school-like town of Mieza where he did along with a few other notables including possibly two of the inheritors of his empire Cassander and Ptolemy Soter. Well, as we all know Alexander was a rather successful king and conqueror. However, his desire for conquest was not contained to the political borders of the day. He wished for his mantle of both king and scholar. He wished to embody the Greek ideal of the perfection of mind and body. The glorious choice which he chose was not to simply perfect himself, but to leave and indelible lasting mark on the world. He would erect the foundation and building of the greatest center of learning the world would ever see for quite a long time. While the idea of collections of books was not unique; there were royal, religious and personal collections for some time. The academies certainly had their collections. Nowhere in the world though had there been anything set to the scope of what the Great Library would become. After Alexander's conquest of Egypt and his subsequent implanting of himself as pharaoh he saw the perfect place to build a city. In that city he would bring to life his vision of a center of learning so massive it would house a half-million scrolls. The small pharaonic town of Rhakotis near the Island of Pharos (famous itself for the Great Lighthouse built a half-century later.) would be the site for this new city. It was founded in 331 and the library started construction probably a decade after the infrastructure of the city was established. That city would soon become one of most influential in the Classical world. After Alexander's death (probably helped along by others) the ancient Kingdom of Egypt fell into the hands of Ptolemy Soter(I). It was his continuance of Alexander's dream which allowed the Great Library to reach its true potential. It is strongly suggested that Ptolemy Soter was one of the Companions who studied with Alexander in the Temple of the Nymphs under the tutelage of Aristotle. I have to agree as well because whatever drive Aristotle instilled in Alexander he also instilled in Ptolemy Soter. 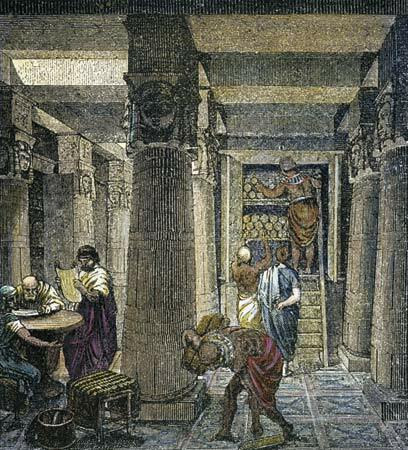 As grand as Alexander's dream for the library was Ptolemy Soter and his dynasty made it happen. The Great Library itself was designed by Demetrius of Phaleron. Unfortunately, no records exist of what the Great Library looked like. The building itself no longer exists. Only a small portion of the Serapeum. Its design was based on the musaeums and gymnasiums of the day. Its scope, though, far surpassed anything conceived or built as an institution of learning. It contained a peripatos walkway, lecture halls, dining areas, gardens, meeting rooms, storehouses, official staff rooms, etc. 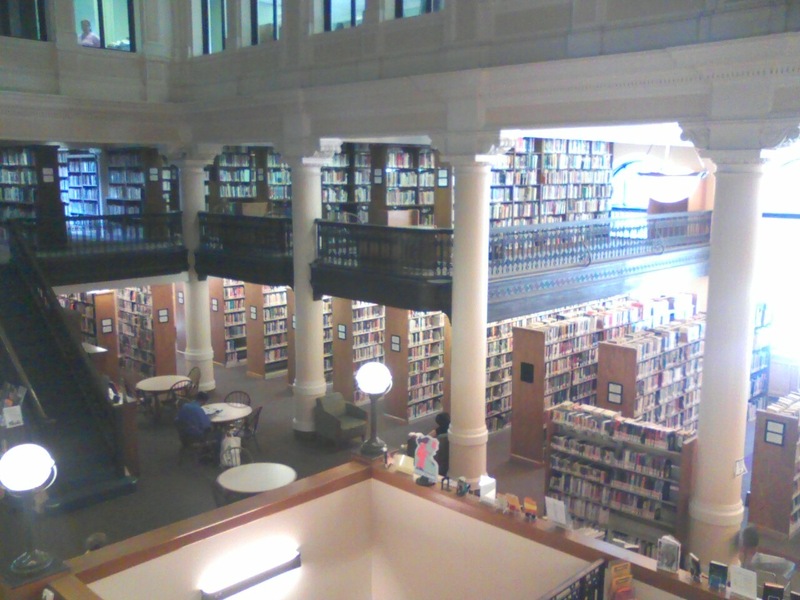 The Great Library is said to be the basis for the layout of colleges and universities. 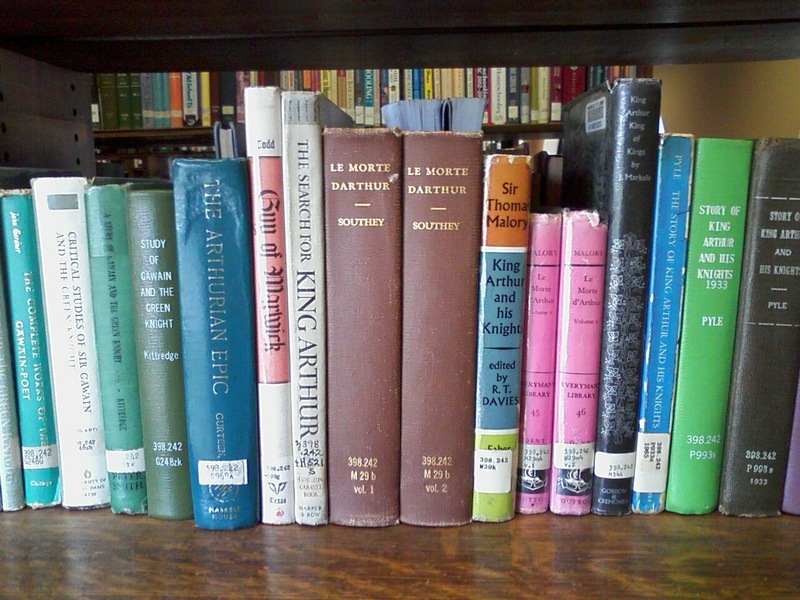 To call it a library is a bit of a misnomer, however the main task of the institution was the acquisition of books which were scroll-based at the time. The actual estimate of the amount is not known but the general consensus has it at about 700,000 scrolls. There are various methods of acquisition which were employed. Most were gathered through purchase and donation. Some people due state that people visiting Alexandria in possession of books not in the Library were 'encouraged' to let the library have it with compensation given. That may or may not be true. Alexandria grew into a thriving. prosperous port with a strong economy. The rich Nile River valley was connected to the Mediterranean world essentially through Alexandria. Today it is still Egypt's second largest city and was the capital until the Muslim conquest a thousand years after its creation. This prosperous city drew the most sought after minds to Alexandria to study at the Great Library. Dissection of the human body which was forbidden in Greece was allowed in Egypt. This allowed for medical discoveries to happen. Astronomy was a major school driven at the library. They got it pretty much wrong, but they tried. (The Ptolemaic "Earth-Centered" universe though was the lasting model until Newton.) Aristarchus who studied there did get it right with his heliocentric theory, but nobody would listen. Eratosthenes, one the founders of modern geometry, studied there. He was the first to measure the circumference of the Earth (and did remarkably well in his estimates). Archimedes may or may not have studied there, but he certainly would have corresponded with his contemporaries at Alexandria. Euclid studied there and gave his famous quotation to King Ptolemy Soter (I) "There is no royal road to Geometry". Hypatia, the female female (to be widely acclaimed) philosopher / mathematician / astronomer was a teacher there. The quest for knowledge which was the mission of the Great Library was not contained to the Greek world. Anything written down be it Greek, Persian, Buddhist, Roman, etc. was welcome material at the library. A thriving Jewish community lived in Alexandria. The Jews who lived there became so Hellenized that they no longer understood Hebrew so they needed a Greek translation of the Pentateuch and other important books of the Hebrew Scriptures. Thus with the support of Ptolemy and the library 72 Jewish scholars were brought to Alexandria and The Septuagint was born. Those of you into religious studies know the importance of that cross-cultural exchange. Unfortunately, like all things in life, good things do come to an end. There are arguments back and forth who is to blame. Some say that Bishop Theophilus in his support of Christian Rome attacked the pagan holdouts in Alexandria by ordering the destruction of pagan temples. The Serapeum being dedicated as a temple in antiquity to the god Serapis. However, there is no proof that any actual books were destroyed, only pagan symbology. It is also speculated that during the Muslim conquest of Egypt the Great Library faced its end when all books in the library which contradict the Koran were deemed heretical and the books which supported the Koran were deemed superfluous. Then again, that may have just been made up over the years but started with a grain of truth when the Sultan of Egypt went after the Fatamid's caliphates collection of heretical texts stored in the library. And yes, Julius Caesar may have accidentally burned down one of storehouses when he set fire to those ships, but that was only a small portion of the reserve stacks. I feel though that the true end came when Rome got entangled in the sultry grasp of Cleopatra in her struggle to retain her thrown in that great Ptolemaic and later Roman civil war. The rule of the Ptolemies ended as the bite of the asp sunk deep into her breast. The end of that sponsorship started the drip of a thousand deaths for the Great Royal Library of Alexandria. Yet, I don't see the scholars of the day allowing all that knowledge to perish. I am sure that caches of those books were copied, or otherwise made its way into newer works which ended right back in other universities, personal and royal collections. 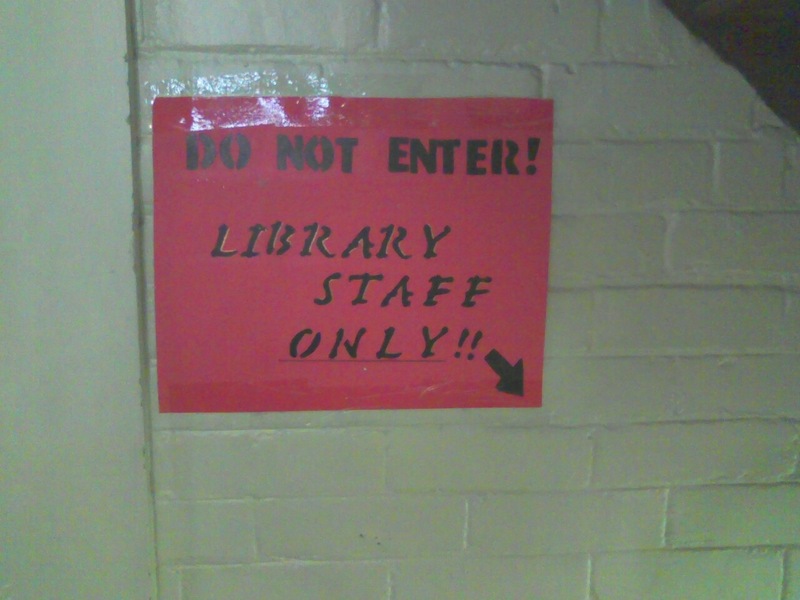 So no, we would not be firing laser beams if not for the destruction of the Great Library. Even though the physical building may be sitting beneath the sea somewhere the mark of that four or five centuries of solid scholarly pursuit for the pure sake of the furthering of knowledge had a mark which did push humanity forward in a great leap. If you haven't been to their new site or have never actually taken a look then perhaps you ought to take a look. If you are a frequent library visitor then this link would be very beneficial for you. It is more than just looking to see if a book is available at the library. They have links to databases, all the libraries which are functioning nodes of the system, maps, etc. There is a cool function called "Digital Treasures" featuring hundreds of beautiful, old black & white / color photos scanned in with description. That in itself is a reason just to poke around for awhile. Here is the link! Go and enjoy! There is a particular quote from Total Recall which would work so perfectly here! I really didn't intend for this blog to take a turn into the negative. However, sometimes the dice just roll out this way. I just hope this week ends without another formative piece of my past dying, burning down - whatever. Mr. McClure was one of those pivotal teachers who makes a mark on you. Before I took his class I always had a passing interest in history. Yet, it was more an offshoot of my love of mythology. When you learn about the Greek and Roman gods you naturally learn about the people and the times. 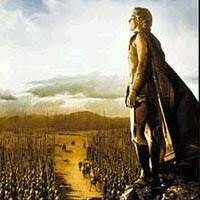 In the same vein I always enjoyed historically based movies be they fact or fiction. I loved the Indiana Jones: The Raiders of the Lost Ark. I loved the movie Midway, Cleopatra, all those old Cecile B. DeMille movies, Monty Python and the Holy Grail... The list goes on. I loved the idea of history, but it really wasn't an actual focus of mine. Mr. McClure, put that focus within my grasp. He was a male teacher for one thing which really helped. The only previous male teacher I had before him was Mr. Fink my 3rd Grade (4th?) science teacher (Earth Science) back in Easthampton. He was another favorite teacher of mine. If I hadn't hated math... I wanted to be a scientist up until Algebra I, LOL. I hated math until college then that switch finally flipped and I saw it in a more 'artistic' sense. (If he taught at Park St. it was 4th. If he taught at Maple St. it was 3rd.) Wow, I haven't thought about him in a long time. He had a rose quartz on his desk. (The rose quartz which I have today is directly linked to my appreciation of his.) He raced at the Riverside Speedway back in the day. He complimented me for turning 9 and said that I was in the last year of my single digits. OK, I am fairly positive that it was 4th grade. Anyway, back to Mr.McClure. I just loved his presentation of the subject. He truly enjoyed what he taught and I really connected with him. He read books and that fact also resonated with me. He molded a lot of potential that had lain within me. He is a man that I completely and totally respected. I take a good portion of who I am today and credit it to him. Here is his bio which was posted in the paper. NORTHAMPTON - Kendall B. "Coach" McClure, 85, of 27 Vernon St., passed away Sunday, June 13, 2010, at the Linda Manor Extended Care Facility in Leeds. Born in St. Louis, July 8, 1924, he was the son of the late Kendall B. McClure Sr. and the late Frances (Titzell) McClure Carlsen. He lived in Texas for many years. He was educated in Texas schools and received his bachelor's degree from the University of Texas, later earning master's degrees in history and counseling from the University of Massachusetts in Amherst. He was a World War II veteran, serving in the U.S. Army D Company, 2nd Ranger Battalion, achieving the rank of captain. He was wounded in the Battle of Hurtgen Forest. He was awarded two Purple Heart medals and was awarded two Bronze Stars, one with valor. After the war, Kendall married his wife, Mary (Fitzgerald), in the Panama Canal Zone in 1951. They moved to Austin, Texas, and later to Northampton in 1956. He was a longtime teacher, first in Northampton, then Amherst, the Williston Northampton School, South Hadley, and retired from Holyoke Catholic High School. He was also a longtime assistant football and track coach in Northampton, at Williston Northampton School and in South Hadley. He was a member of the Massachusetts Teachers Association and the U.S. Army Rangers Association. He was also a longtime communicant of the former Blessed Sacrament Church. He loved football and was a voracious reader. Coach McClure is survived by his wife, Mary; his son, Dwight Carlsen McClure of Westfield; his daughters Barbara Neslin and her husband, Stuart, of Rome, Ga., and Patricia McClure of Portland, Maine; his brother, Donald P. McClure of Corpus Christi, Texas; his six grandchildren, Sheila, Andrew, Nate, Kenneth, Annie and Thomas; his four great-grandchildren, Brandon, Grace, Kendall Mary and Annabella; and nieces and nephews. Coach McClure's funeral will be Wednesday at 9 a.m. from the Ahearn Funeral Home, 783 Bridge Road in Northampton, followed by a Mass of Christian Burial at 10 a.m. in the Annunciation Chapel of St. Elizabeth Ann Seton Parish. Burial will be at the convenience of the family. Calling hours are Tuesday from 3 to 7 p.m. Memorial donations may be made to the Northampton High School Football Program, 380 Elm St., Northampton, MA 01060. The following is copied from the blog All Hail Thorndike Pickledish. Why you ask, am I posting this? Well it is in the mission statement. That being that you would basically learn what makes me tick as we journey throughout the libraries and museums of Western Mass. Well, Mr. Smith played a role in a major part of my life. If you take a peek at my profile you will see that I have Japanese animation, i.e 'anime' listed in my likes. Well, Mr. Smith, was a voice actor who helped bring that art to North America. I could delve into the whole history of anime, but I will save you from that 'geeky stuff'... I am unabashed in my appreciation of that form of art. I am more a fan of the old school stuff, but I still watch the newer series and movies. We all have things which have helped save our sanity over the years, well anime worked for me at a time when I needed something. To be quite honest you can in part thank my desire to write to that era of my life. I was very sad to hear of his passing. He was a very talented man and I am a firm believer that you need to observe masters in action to help unlock your own potential. He was one that I can say that I learned from. R.I.P. Robert O. Smith. It is with the heaviest of hearts that we, the children of Robert O. Smith--original Bench Bozo, "Masked Avocado", Dr. Zingrr, Walter Wart the Freaky Frog, lifting legend and so much more--announce his untimely passing at the age of 67 from pancreatic and liver cancer. Unlike Ronnie James Dio, he was NOT--to the best of our knowledge--eaten by a dragon, but surely there was some strange "disturbance in the force" or cosmic kryptonite that finally brought down our very own superhero of a father. His wishes were simple--no public memorial, no digital gold-plated turbo-casket with fine cordovan leather interior and motion-activated whirling Mercedes-Benz hood ornament. He requested cremation and a celebration of life among his closest friends. If you would honor him, keep on doing what you do--bench with the best of your ability and passion, striving ever toward bigger and better lifts, or create art and sound, inspired by his memory. We will keep that memory alive and continue to update Bench Bozo and All Hail Thorndike Pickledish, sharing images and his original drawings from a lifetime dedicated to lifting and creativity. Our thanks to all who knew, loved, and shared that dedication with him. We will love and miss him always. OK, now that I have offered tribute to the boosters, it is safe to say that while I didn't need to call in the gendarmes... Springfield is always a fun place to visit. Why just as I was taking a photo of Deacon Samuel Chapin outside the library I was stared at by a man in high water boots, standing on a stump, playing with a fishing pole. I kid you not. Now... as far as I know there is no fishing remotely near him or on the library grounds. He could have been attempting to capture pigeons... for the city... or maybe he was just pretending to be a fisherman. Neither of those possibilities give the answer of why he was standing on the stump. I honestly don't want to know.What is even better than that - none of the other park residents seemed to notice save I. Yet still, some people wonder what I have against Springfield. All I can say is things like this doesn't happen in South Hadley or maybe it is just because I live near the river where people can fish for real. I wonder what the good Mr. Chapin would have thought about a man standing on a stump in a park with a fishing pole and no nearby body of water, let alone fish? 'Hmm... Maybe he was an artist... no, don't get me started on that.' I agree, Mr. Chapin. Anyway, Springfield! I took my usual sojourn into Springfield down Rt. 91. The traffic cones were in perfect bloom as I drove down the highway. The beautiful, bold Sun brought out their particular orange hue which often screams, "You're going to die!" as you drive by at the flow rate of traffic which routinely exceeds the legal and safe rate. 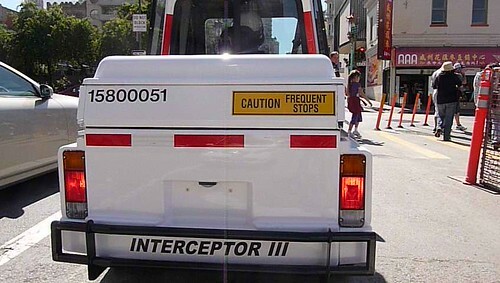 As I descended into the city proper I was greeted by one of Springfield's more connected citizens driving by in her Interceptor III police vehicle. I waved - glad that I wasn't one the fools who can't read a parking sign. 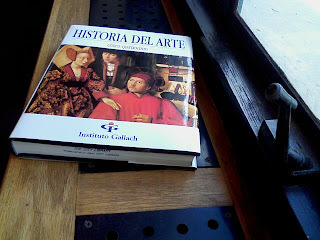 I am a frequenter of libraries and that was where I was going. So I took my usual wrong turn off of State St. onto Chestnut St driving the wrong way on the one-way. Deep in my heart though I knew that I was in the right. That should be a normal turn and that is because the person who designed the street design in Springfield was the same British inebriate who was kicked out of Boston after drawing up their street map. However, I made it without incident and pulled into the little parking lot that services the museums. So there I was. As I said it was a beautiful day. Western Mass had survived two days of tornado warnings. 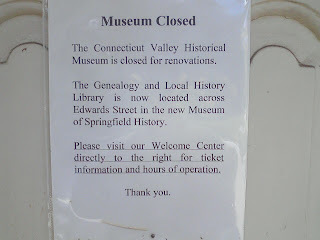 The museums were still standing, as was I. I felt that God had deemed that be for some reason and I was accepting it just fine. 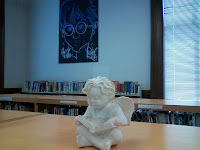 Today's blog entry is going to just feature the library. 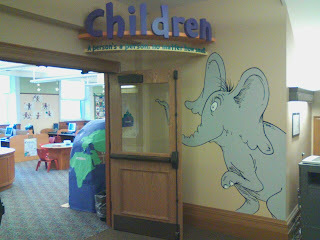 So even though I did very much enjoy the Doctor Seuss Museum - that is another blog entry. Plus, one of my pictures did not work and I need to go back and re-take it. Although for a little cell phone camera I was very pleased with how it takes outside shots. memory though is an issue and I had used all mine up. Anyhow, how did this fine building come to be? The building was opened in 1912. It is all there on the the Library's History Page. 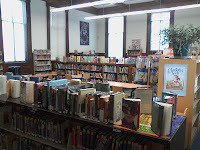 If you decide to read that and you've been paying attention to my blog you'll find that this library shares histories common to both South Hadley and Holyoke. They are all institutional buildings driven by a public desire for a library, granted a donation of land, given help by wealthy, evil industrialists, in particular, Andrew Carnegie. 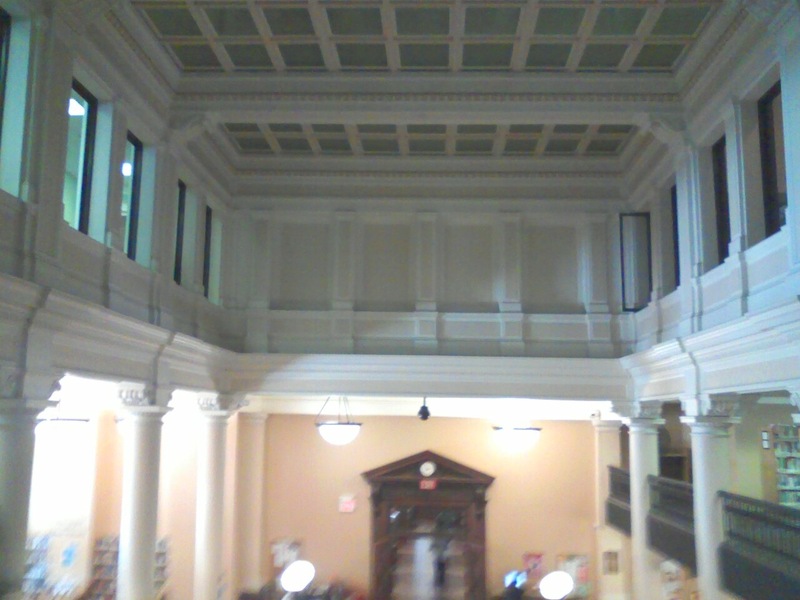 Both Holyoke and Springfield share building designs inspired by the classical boom of the 1800's and spent time in their respective city halls during their gestation period. Springfield being the wealthier of the two did get the bigger chunk of land. 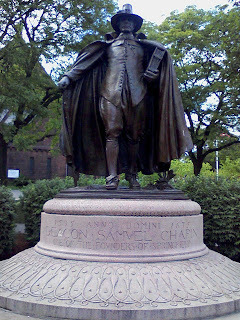 What makes Springfield interesting and the Quadrangle possible was the looseness of the Springfield charter which widely interpreted their mission. 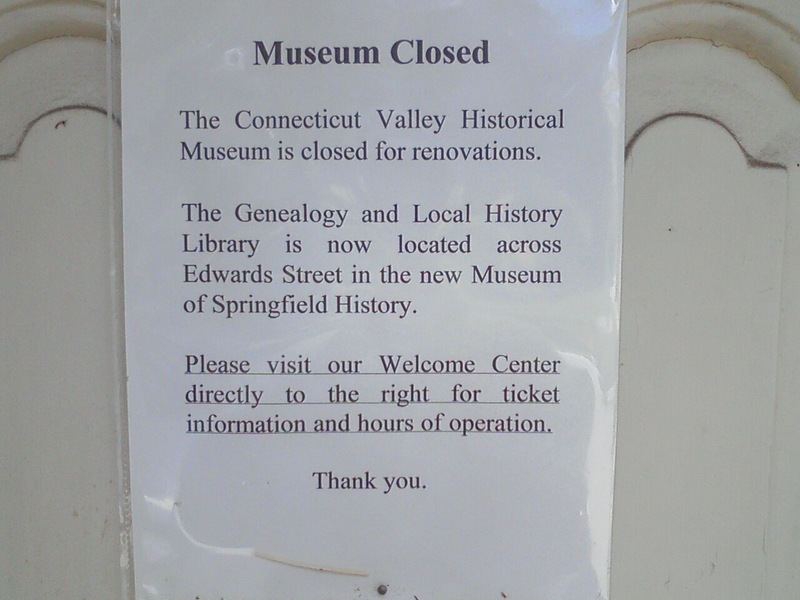 The donation of George Walter Vincent Smith sparks the line of demarcation between the library and museums, but up until that point it was the mission of the Springfield City Library. As you know I found one thing particularly interesting when I researched the history here and that is the whole "Peoples College" thing. I am currently researching the roots of that term, but it still stands that Springfield probably stole it from the Holyoke inauguration (see below). 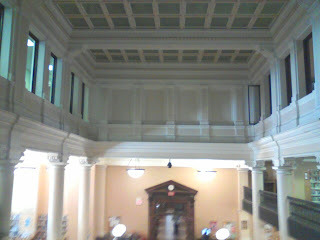 When you walk into the building it is very much like walking into the Holyoke Public Library only on a grander scale. 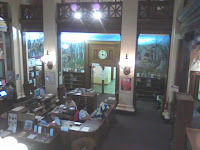 The Holyoke Public Library having opened 10 years earlier than Springfield you can see the similarities.If you know the history shared between Holyoke and Springfield there are many instances one-upsmanship between the two municipalities... I am a Holyoke guy... and yes I have my reasons to hate Springfield. This would not be the first or last time Springfield stole, ahem, 'borrowed' from Holyoke. What am I talking about? Why Basketball, of course! I used to work in the Holyoke YMCA and I heard the old timers talk. Volleyball was not the only sport invented in Holyoke, but that is another story. 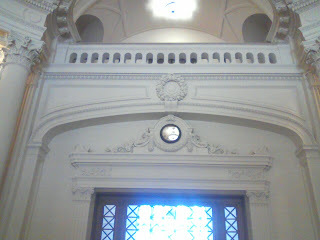 Yes, it is a nice rotunda. 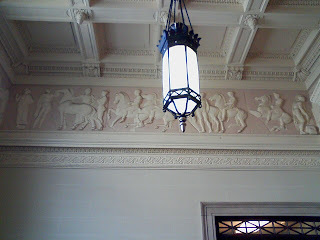 The bas reliefs and the friezes are quite nice. 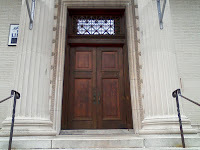 (There is a humorous story concerning that ante-room that you walk into off of State St. but that I can't get into here.) No, honestly the rotunda is beautifully done, however, they have this nice bust of Carnegie that is sitting there in the dark. I wanted to get a picture of it, but it was too dark for my poor little phone. They really need a nice soft little light on Andy. If you stand in the rotunda you can walk straight through to go from the museum grounds to State St. Information and Reference services sit in Wellman Hall and you have main reading room on opposites from each other. The first time I ever went to this library was my freshman year in high school. I was looking for books on some report that I was working on and Springfield had more available because somebody who was working on the same project had hit Holyoke before I had a chance. The library seemed huge then and it still retains that feeling. This is a big building. To my surprise very few things seems to have changed over the years. 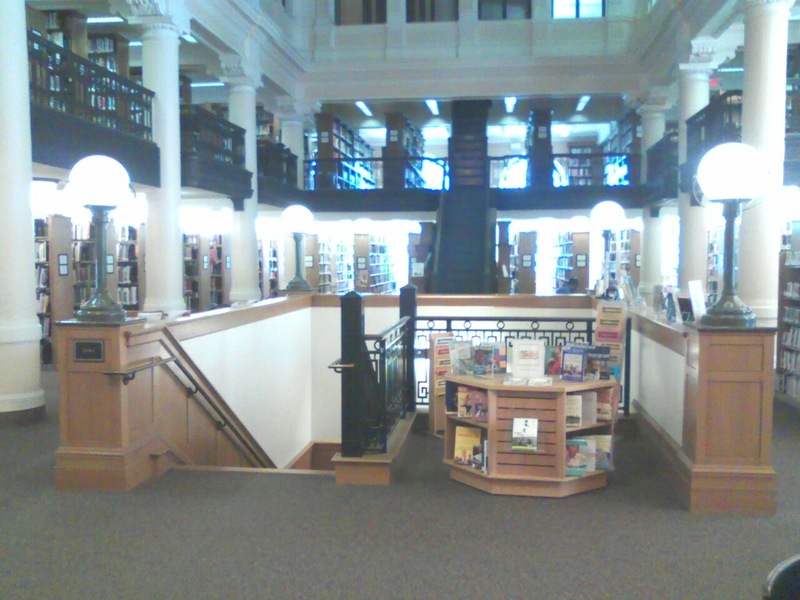 The card catalogues once flanked the stairs leading up to the mezzanine level. The computers are obviously a new addition as libraries are marching into the age of connected living and the Internet. Also new are surveillance cameras which help guard this building. I think out of all the changes I was saddened by a need to see those installed, but it is a sign of the times. Not having the card catalogues there are a sad sight too. Unfortunately the truly sad angle there is that fewer and fewer people know about the card catalogues, so we won't go there. One factor that did remain the same was the desks that you can sit at and work. 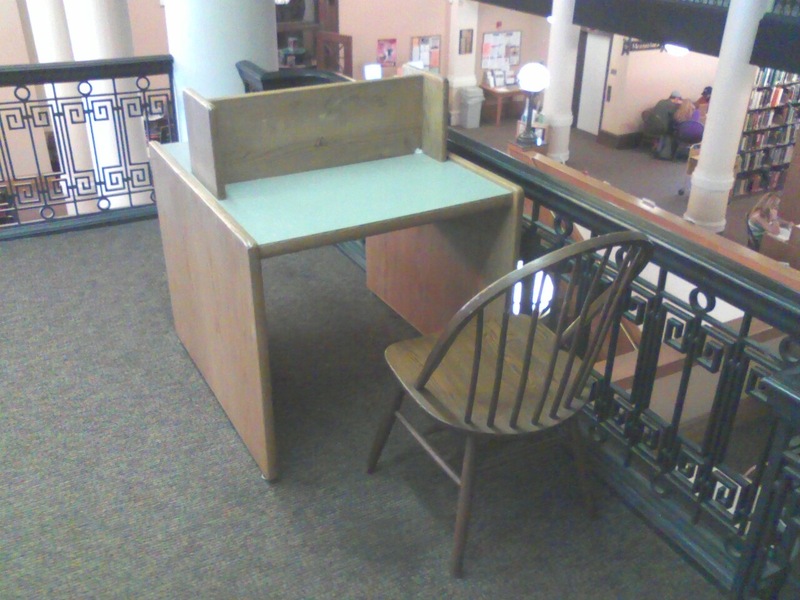 When I was going to STCC I spent many afternoons with a book or two sitting at those desks working on homework. I walked in I felt a connection to my days at STCC. Working on homework as I killed time between classes. As I wandered about I wondered also who else might have recently been here. This library does service so many people you are bound to cross paths with people you know. The first area I was seeming drawn to was the histoy and folklore section. I was happy that the spirits drew me there. I spent some time just enjoying the aura of my past. 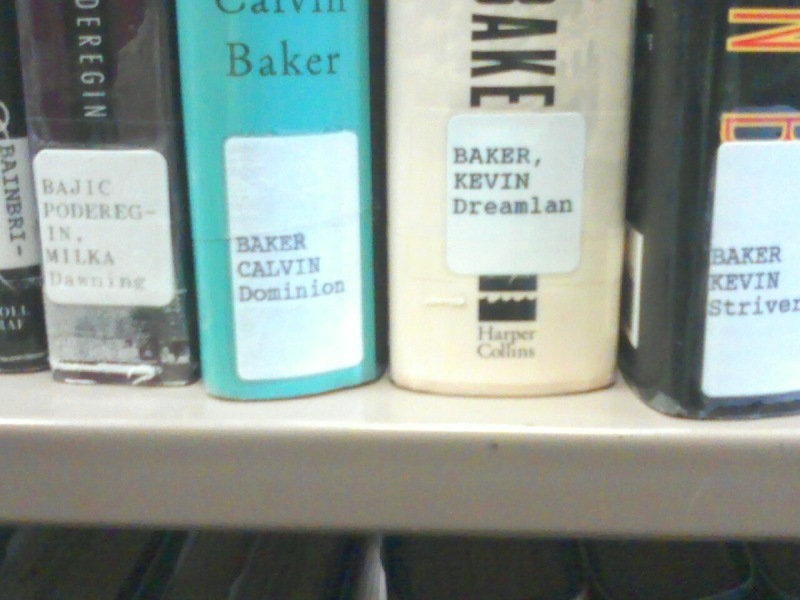 I felt the mission calling me and I ventured into an area I knew was there, but never really bothered visiting - the fiction section. That area lies down the spooky stairs. 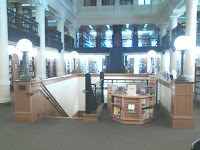 As you walk into the non-fiction section from the rotunda you pass by a set of stairs leading down. 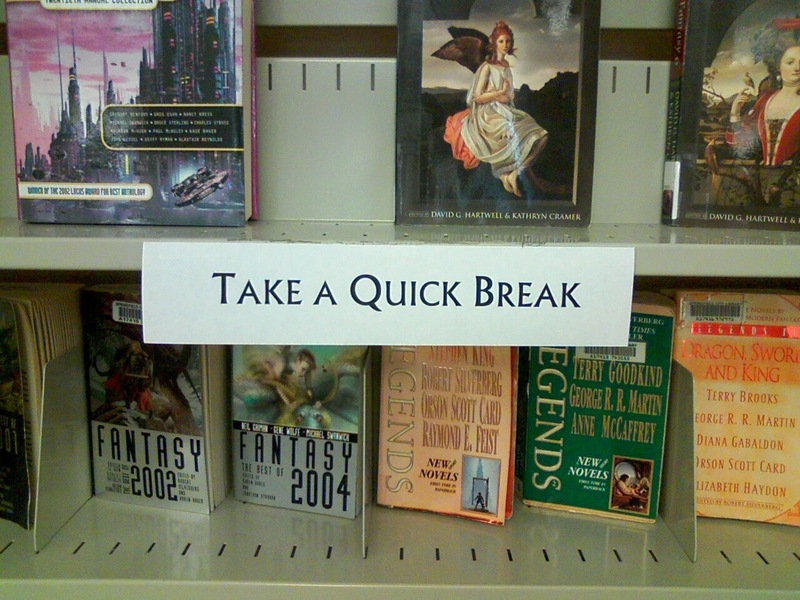 The fiction section is down there. I will admit that it is a nice, comfortable reading environment. Many titles, different subjects, are down there. 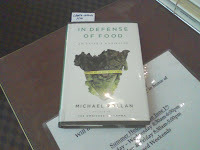 Since this is one of the largest contemporary libraries in Western Mass you can expect to find what you seek. 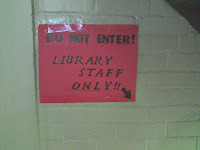 The poor librarian dude did not quite know what to make of me walking around and snapping photos. I am sure that I was on their surveillance cameras. I know that they were watching me, but this is good. I would hate to see anything bad happen to this "cultural gem" despite any feelings of antipathy I may have against its host city. Yes, Springfield City Library I don't blame you... Its not your fault. One thing that I did go to right away and this may be a "to do" item on all my forthcoming library visits was to snap the location of where my novels shall reside once they are published. Also residing down in the basement and unlike the more more humane Holyoke Public Library is the Children's Library. Yes, apparently Springfield didn't get the memo and they still hide away their noisy brats down in the basement. No, sorry Little Timmy, you need to down into the cold, dank depths of the basement. It just goes to show how Holyoke is on the cutting edge of empathic treatment of rugrats and crumb crunchers, while Springfield is still stuck in the dark ages. Look at this picture... Notice even the clearly anti-Republican imagery inherent. Using Horton like that - a shame. 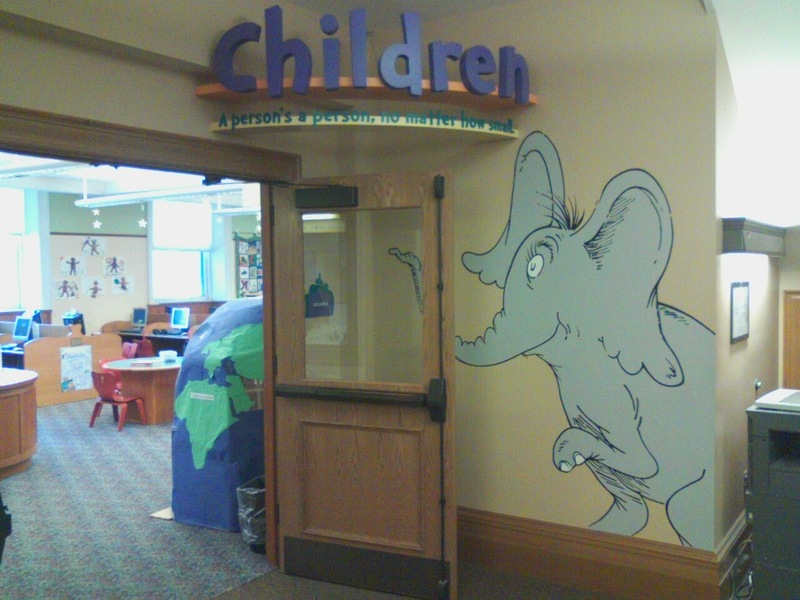 Yes kids, it is Republican Party's fault that we have to cram you down into this little room. Here are a few more images that I took down below. There is a lower level street enterance off of State Street which will get you directly into the fiction / children's area. The hallway runs past the picture of the display boxes. Notice how careful I was not to get an image of myself in the reflection of the glass. Also depicted is a nice little display of books that one walks directly past. I was pleased by their choice of fantasy and science fiction to populate the display. Yes, geeks like us deserve our due. Overall, I did have a good time visiting. It is a fine library. I do plan subsequent visits as I journey through the other museums of the Quadrangle. I greatly look forward to coming again. Also keep an eye for my visit to the branches. Two libraries remain of my first set which one shall I go to next... wait and see. Thank you for joining me on this visit to Springfield. As much as it galls me I shall be coming back to Springfield it would seem. 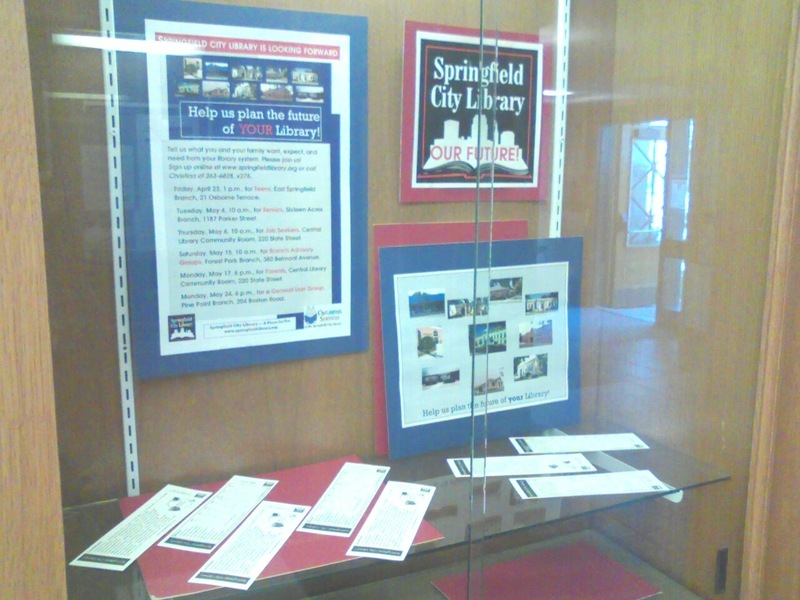 OK, when I was looking into the history of the Springfield City Library... I noticed that at its innagural soiree, according to its history website, it was dubbed "The People's College"... Do those words sound familiar? 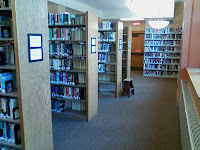 If you have read my blog they were uttered (supposedly, maybe so, maybe not) also at the opening of the Holyoke Public Library. I know whom I am hoping is correct... And those who know me know who I am not hoping for... LOL! Hi there folks. I am about halfway done writing about my adventures in Springfield. I will have that ready for you tomorrow. I was going to post what I had, but I know that you prefer perfection from me and would rather see the complete article. I always endeavor to give that to you. I won't rush this tonight and I can't very much give you half... that is too much of a tease. No, you've all been patient and I appreciate that. You shall not be disappointed. However, a nice bit of info did come my way through a contribution sent to me and I felt that you would like to know about it. 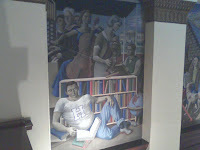 Apparently, in Westfield, a very nice mural is about to be unveiled in the Westfield Athenaeum. It depicts Westfield - the Whip City's - colorful history. I lived in Westfield - it is a fun town. I can't wait to see this mural created by the famous muralist David Fichter. 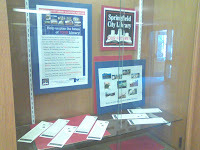 I did, however, get a chance to visit the Springfield Public Library today. I hope to have something for you soon. Tomorrow is looking pretty full as well. So perhaps Wednesday night you'll have something to look forward to check out. As for your link.. here is a fun option that you may or may not have known that Google could do. So yes, your link is Google, but before you turn away in horror, just hear me out and take a look. It is a nice tool if you are looking to piece together a timeline. I chose Irish History in Holyoke and viola there is a ready made timeline. Sure, I wouldn't trust the worth of every link it dredges up, but still it is a nice start. They are all nice little vignettes in time. So here it is and enjoy. Maybe see you tomorrow with a link, but certainly Wednesday with my trip to Springfield... yes I will dodge bullets, brave the traffic and kill what's left of my car's suspension for my art. What I am going to talk about is why I chose this name. The answer is it sounded cool. This is true. While that may be true that is not the entire story. There were a variety of factors that went into the choice. First off, I wanted something that sounded along the lines of what I wanted to present. So yes, it had to sound erudite, witty, somewhat original. But also, I wanted to show a more philosophical flair. I did not want the name to be sterile, but I wanted it to add a deeper flavor. Finally, it had to reflect the mission. That was obvious. I think that I managed to do alright on all three to varying degrees. Thus, my visitations to these establishments constitute my attempt to re-connect to that archetypal environ which through the ages (and I'm sure with God's help) blessed me. So I chose to honor and very much enjoy time with these the progeny of the Lyceum. So please, read up and learn a little more about one of the many sparks which gave us this world of free and open expression. There really is a plethora of outstanding, informative, philosophical, witty, funny links out there. Since actually visiting a library / museum per day really isn't going to work into my schedule all too well I have decided to add this idea to the mix. For an undetermined amount of time into the future (i.e. until I feel I have enough cool ones) I am going to add one link per day and speak on it a bit. A bit being, you know, a bit.. a little blurb. Unless, say, it totally changes my life and I decide to ramble on and on about it trying to guilt you into visiting it (because it is something you should check out now... before you forget). So next year we can enjoy International Museum Day here! The above pic is taken from the Art Daily.org article. I just spent a portion of yesterday and today trying to find a photo of this man. Google is not being very cooperative today. 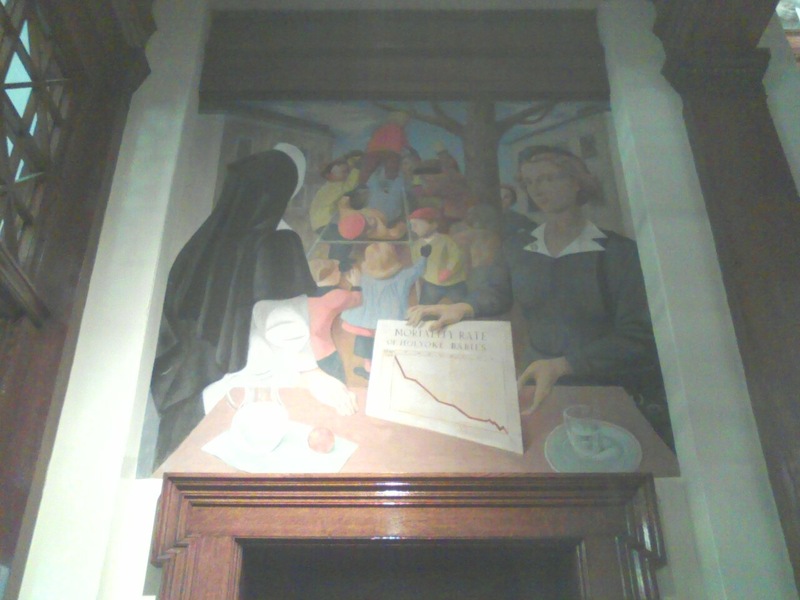 I wanted to speak a little on the artist whose murals adorn the walls of the Holyoke Public Library and many, many civic and municipal centers about the country. There doesn't seem to be any dedicated pages to him or even a real Wiki article, but I did find a write-up on the man. Unfortunately it seems to be an obituary of sorts. Still though it is a nice read and it is worthy of directly linking to it. So if you are interested in learning about this man who started his interesting career by winning a national art contest at the age of 22 then check out the following link. Enjoy! Down below you see two books. One was sitting in the back seat of my car. The other was sitting on the circulation desk in the library. 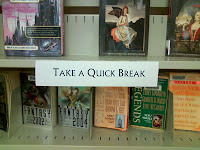 I kid you not, you can call the librarian on duty yourself to verify my story. As she and I were talking about the library, my little project, Mount Holyoke, Graziani, etc... that book was sitting right there on the desk. 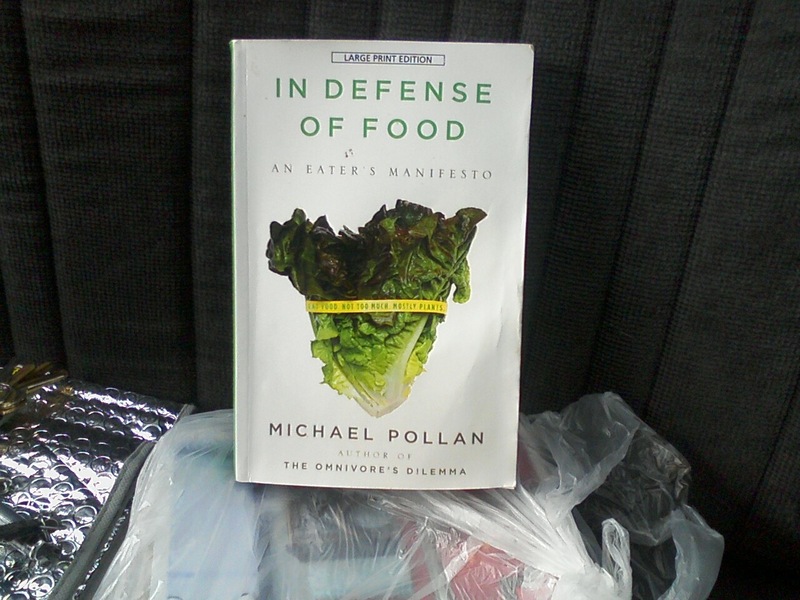 Why do you ask is In Defense Of Food sitting in the back of my car? Well, it was given to me by my Mother. You can call her and verify that part of the story too! LOL! God just loves playing these little games with me. What is the message being sent to me? Well, I have my own interpretation of that, but maybe this little project of mine has received some manner of "Official" sanction. 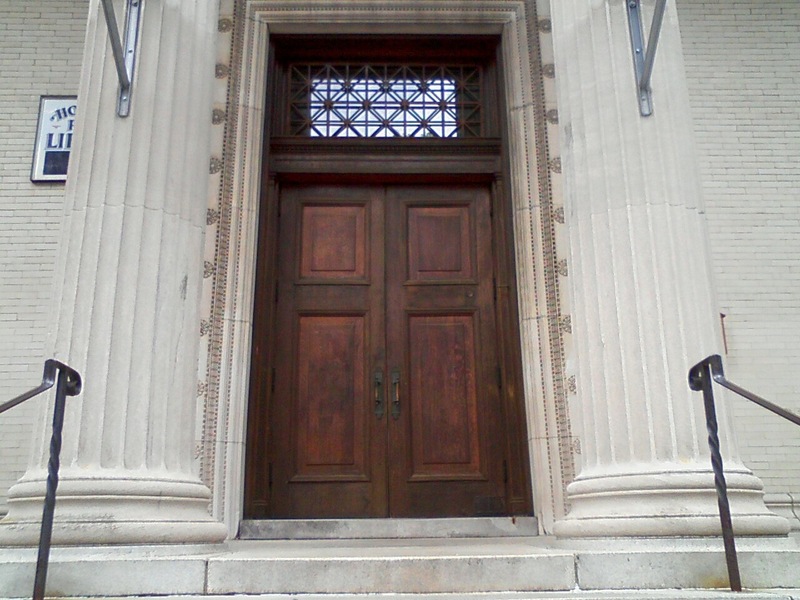 The Holyoke Public Library - I can't say how many times I passed through that door as a student at Our Lady of Perpetual Help School and Holyoke Catholic High School. That would be 5th Grade to 12th Grade; a solid 8 years of good memories. This building had such a major impression on me as a youth. Honestly, I can trace much of my appreciation for old buildings to this one. My appreciation for old houses has a separate origin - old buildings, right here. The building has seen its years, but I was happy to see a dedicated core community working to preserve this masterpiece of old craftsmanship that is often at the heart of our major cities. These buildings may be surrounded by blight or what some may deem undesired, however when you walk in them you are transferred back in time. They are nice substitute for a time machine if you are looking for one. [That clock was my watch!] 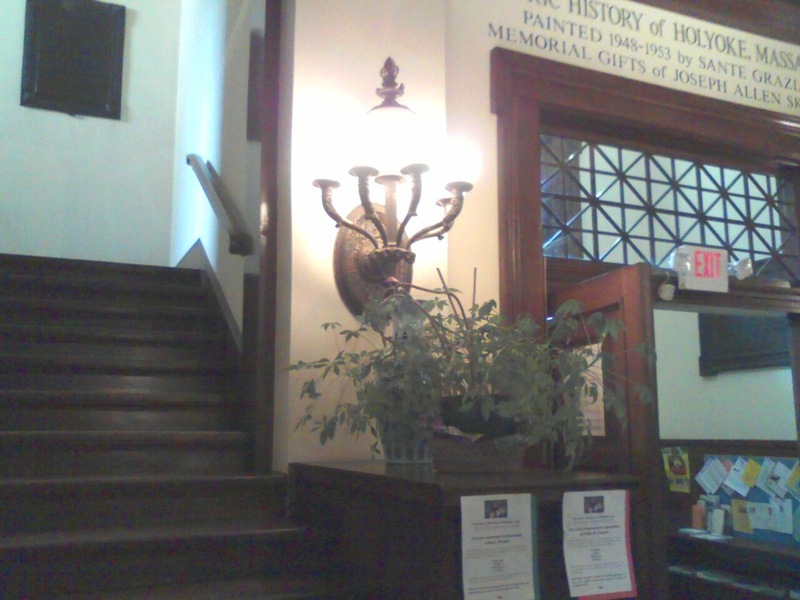 The Holyoke Public Library, like many other older libraries in the region, was not originally built where the building currently resides. 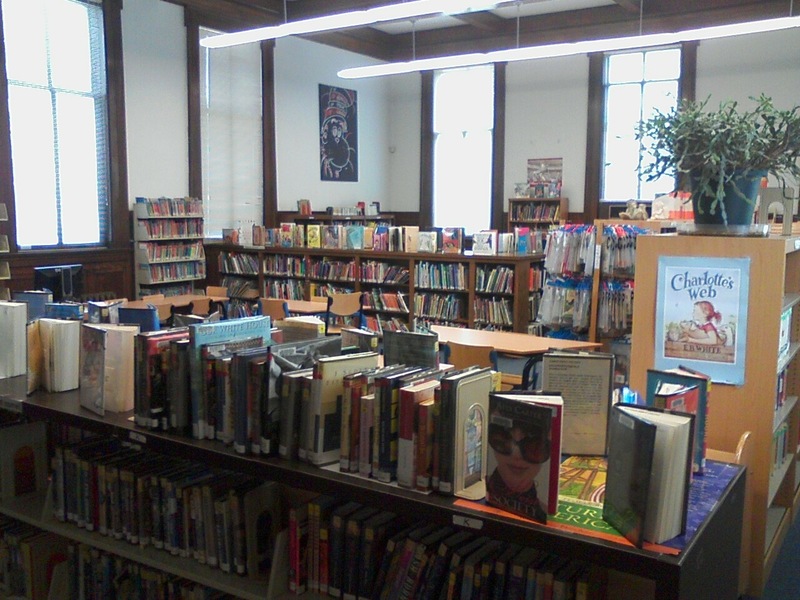 The original location for this library was the old Appleton Street School. The Holyoke Public Library Corporation was established in 1870 a few years before the incorporation of Holyoke as a city in 1873. (I'll have to go fix the wiki page! 1850? LOL!) 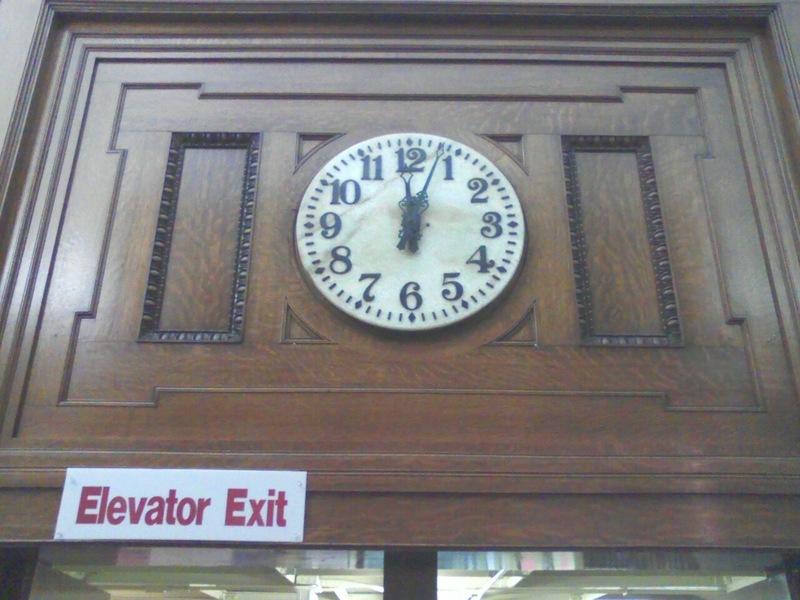 It outgrew there and was moved to the upper level of the Holyoke City Hall where it remained for about 25 years. 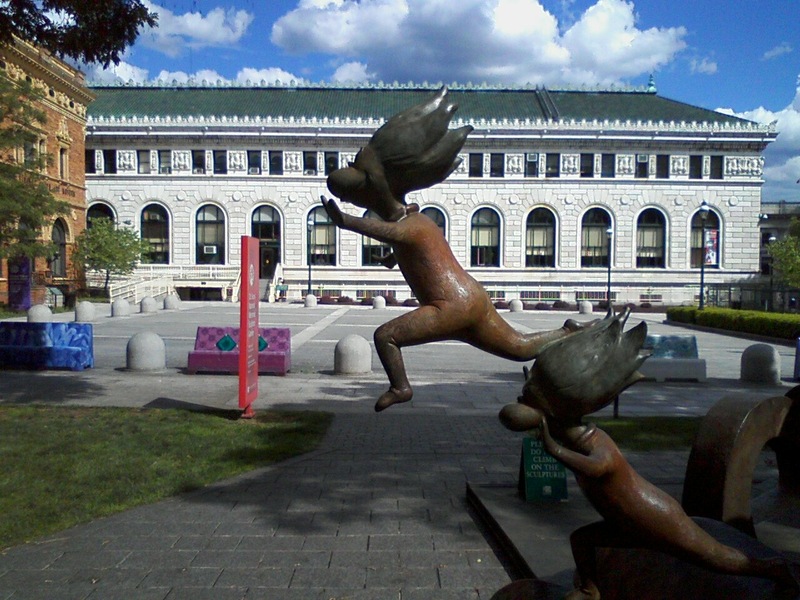 In 1897 with the help of evil corporations and greedy industrialists the library was first moved to a piece of land donated by the Holyoke WaterPower Company when the library outgrew its confines again. Finally in 1902 in full Greek Neo-Classical glory the new building was opened! Where it has remained to this day. It has seen its ups and downs financially like all other non-profit orgs, but Providence has deemed fit to see it stand through the years. 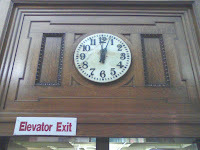 The first thing one notices when entering this building is the circulation desk (if walking through the main door). Soon after though you are looking up at the beautiful murals of Sante Graziani. They adorn the upper walls of the centrally located circulation room. 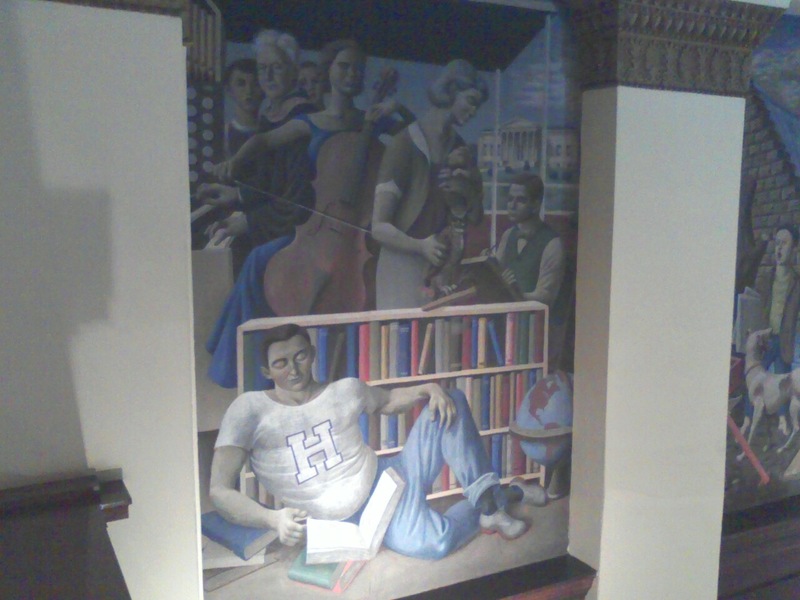 They depict an allegorical history of the City of Holyoke. 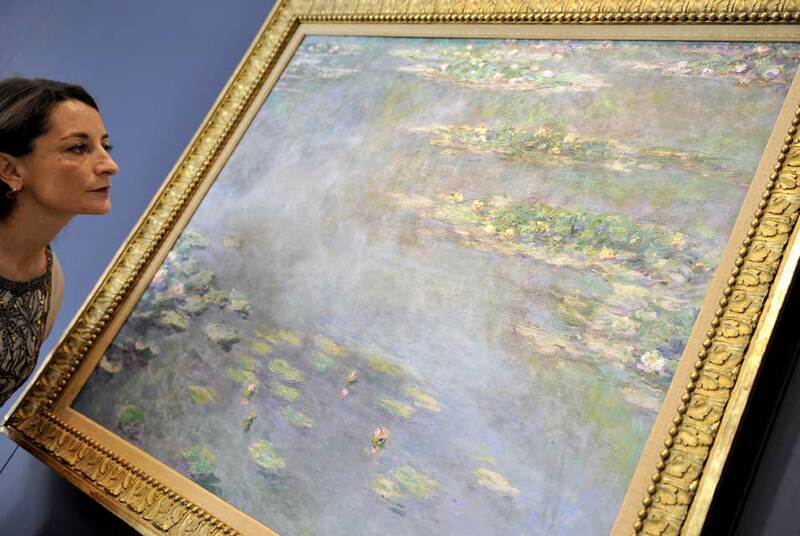 They, in addition to visiting an ornate neo-classical building, are a reason to look in and enjoy if you like art. A side note - if you've been to the South Hadley Post Office, you've seen Graziani's art. 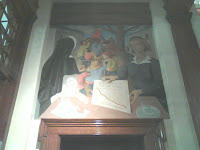 These murals adorn the four walls of the room. Now it had been a very long time since I've been in this building. As I drove up and parked on Maple St. I was wondering what had changed in my absence. As I looked around Library Park I felt a little trepidation. It did not look the same as I remembered it. Unfortunately though, that is the story of Holyoke. I am quite used to that feeling. My old Church burned down and its school went with it (OLPH). My old high school no longer resided on the same grounds that it once did (HCHS). When you drive through that section of town it is hard not to compared it to memories of a better day. It has changed and not for the better. I grew up there, I know. Fortunately, I was not disappointed. I was very pleased. 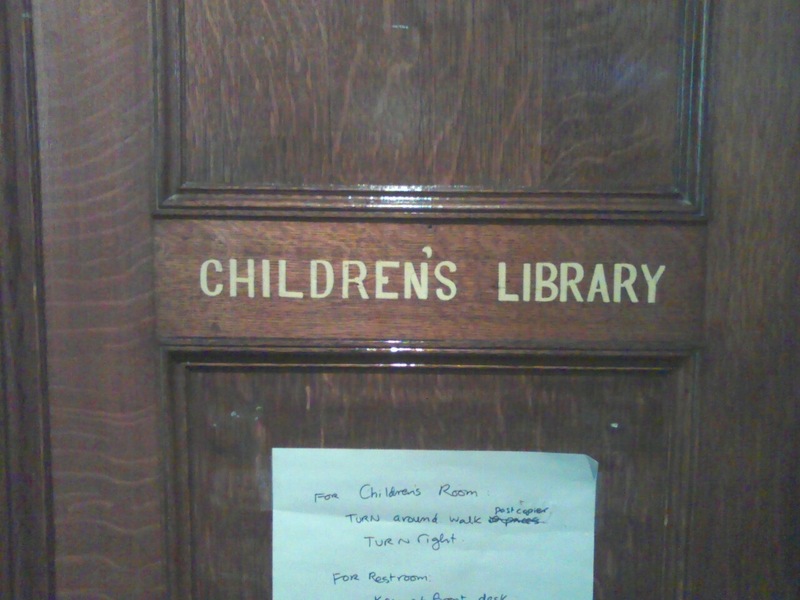 Well the first change I noticed off the bat was that the Reading Room moved over to the other side and the Children's Section moved upstairs. I was saddened by that. I was looking forward to take a walk downstairs to the chamber where we boys raced to get to the best 'Which-Way?' 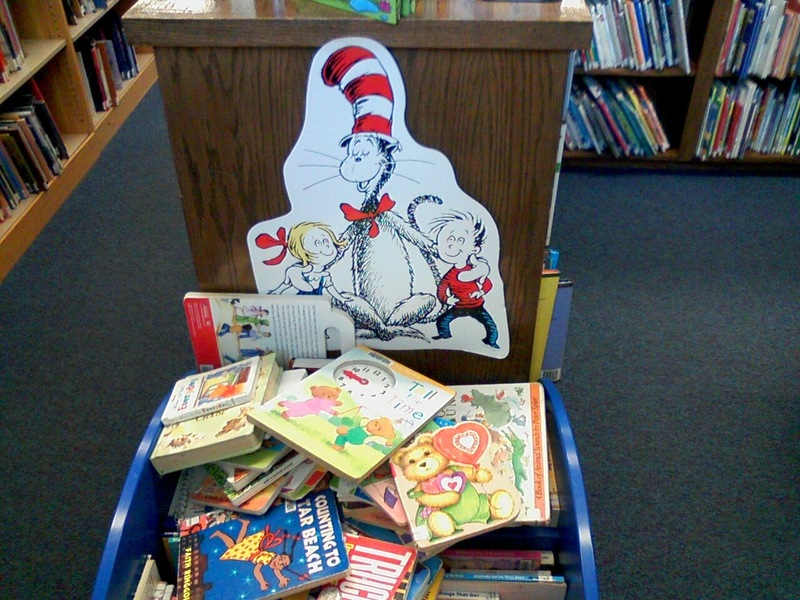 books when our class visited the library. The spot where I usually sat and worked on reports - where I and a fellow 7th Grade Student worked diligently everyday after school on our Science Fair winning report on Eartquakes - was now a Cat in the Hat display. It's true! I have a picture. However, I did have to concede that the room was nice and bright. Perhaps sending all us little noisy brats down into the dark, dank basement was probably not a humane way to attain serenity. Oh well, at least I get to include complaining about that amongst the ordeals of my youth! 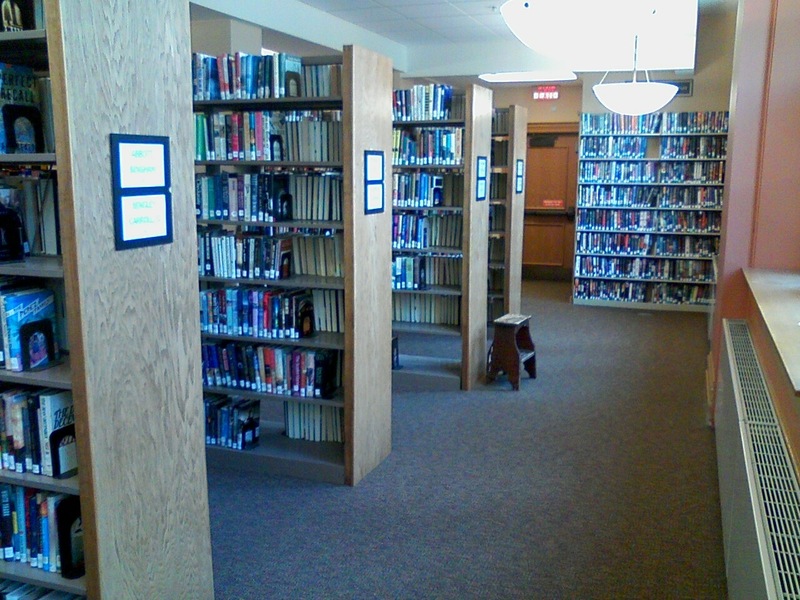 A few other changes included media located in the circulation room and the microfilm / reference room being changed to a computer room. That made the central area feel a little 'busier' than I remember, but all in all it wasn't distracting. The mood and aura of the library was clearly what I remembered. It feels much the same as if I had walked in 25 years ago. As I stated earlier the inside of the building is quite beautiful and if it received more funding over the years it could easily rival Mt. Holyoke in its grand presentation. Still however, for a cousin who has seen its share of hardship you can still feel the tremendous spirit of its birth. 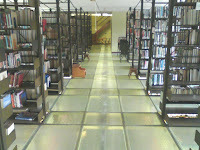 The library has two levels accessible to the public. The main body of the library is on the bottom level. The upper level houses the community room, a nice display of library history over the years, older books and staff offices. The Holyoke History room used to be up there, but has been temporarily located at Holyoke Community College. The building is currently in a state of repair. The move of the History Room was one of the necessities. It was refreshing to learn that the city was moving ahead with its plans to restore the structure. At 108-years of age... yeah it could use a little work. I look forward to seeing the plans reach their fruition. Overall, this was a most enjoyable trip. 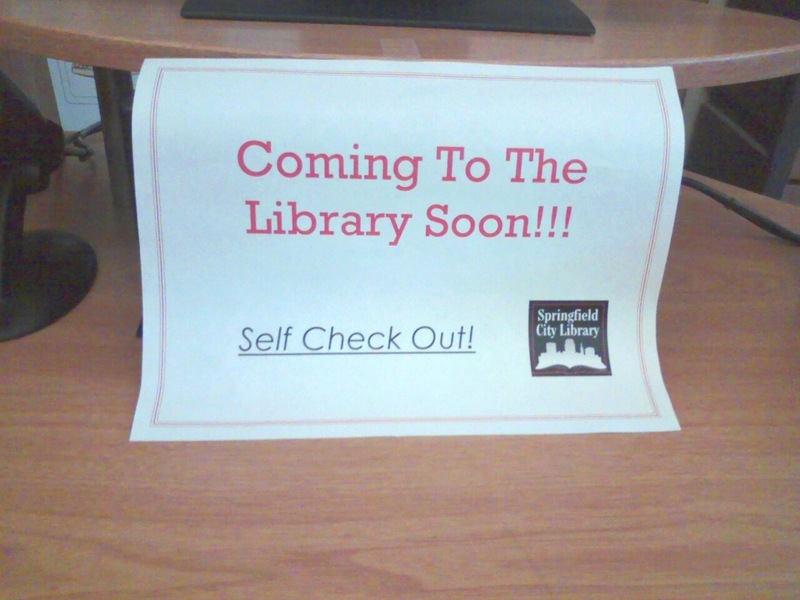 I was looking forward to it as soon as I designated it as my next library. I was not sure what to expect. I don't know if I want to say that I had forgotten what the inside looked like. If I sat and thought about it I would have remembered everything eventually. I knew the basic layout and design. Perhaps it was a little smaller than I remember, I was a teenager when I was going here. 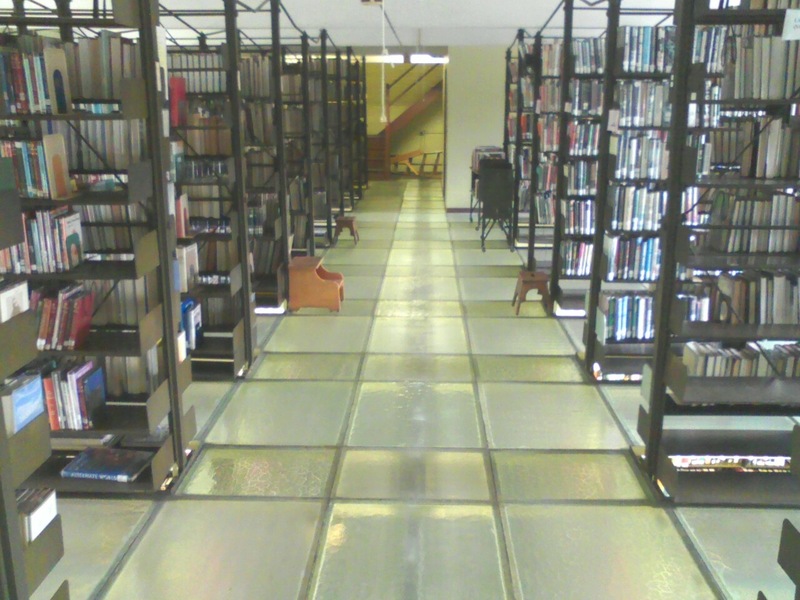 One thing I clearly forgot, but to which was immediately reminded was the translucent floor in the adult stacks section. I loved that floor! The beauty of the interior was a factor that I had underestimated. It was a very happy field trip and reunion. Here are a few more photos that I took that I think you would like. Enjoy! I have chosen the first libraries that I am going to visit. I feel that it would have worked out this way anyway because I would have gravitated to them anyway. I want to visit these libraries for different reasons. All have played some important role in my academic life. The South Hadley library was the natural choice for my first as it is right around the corner essentially. 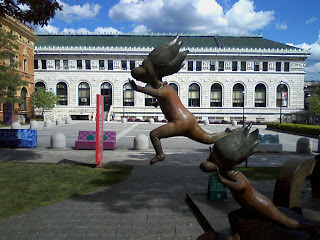 The Holyoke Public Library was probably the most important library in my early educational development. I will speak on that more in my report. The next three I want to put out there, but I am going to refrain on speaking about them until I get a chance to visit them. I am not sure about the order that I am going to visit them, but the next three are: The W.E.B Dubois Library at UMass - Amherst, The Springfield Public Library - Main Branch & The Alumnae Library at The Our Lady of the Elms College. There are more, but I have to say these are the libraries I have spent most of my time in during my continuing academic career with the exception of perhaps the Holyoke Community College Library. I look forward to visiting these three in the near future.